The early 20th century mathematician Srinivasa Ramanujan was, ‘of all Indians, . . . the first whom the English knew to be innately the equal of their greatest men,’ E. H. Neville, a Cambridge mathematician and contemporary, said. 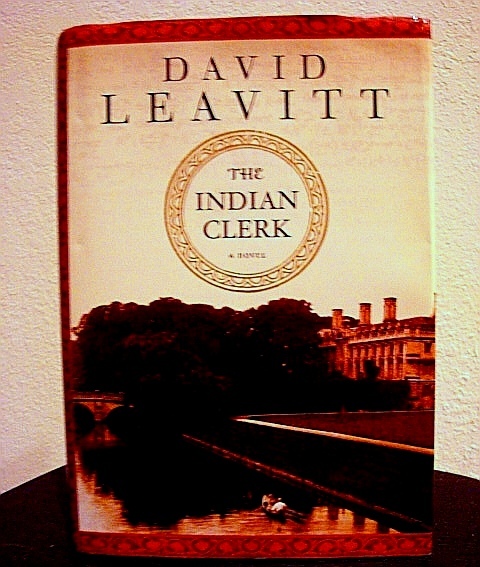 But David Leavitt’s novel, The Indian Clerk, shows how its subject did not exactly fit the West’s conception of a rational thinker. It reveals a striking gap between Indian and Western tolerance for extra-rational ideas and beliefs. Halfway through The Indian Clerk, David Leavitt’s novelisation of six fateful years that the Indian mathematical genius Srinivasa Ramanujan spent at Cambridge – before and during World War I – his fellow-mathematician and tutor in Western maths, G. H. Hardy, muses about his friend’s hopeless exoticism. Here he is, after all, in English clothes and on English land, and still Hardy can’t begin to penetrate his carapace of cultivated inscrutability. Only occasionally does Ramanujan let something slip, a whiff of panic or passion [. . .] and then Hardy feels the man’s soul as a mystery, a fast-moving prickle beneath his skin. For most of a century, A Passage to India, a story by a monkish Cambridge don, has reigned unchallenged as the most sensitive and astute encapsulation – in fiction or fact – of the riddles that Indian culture and thought present to Westerners. At long last, Leavitt – a 47 year-old American notoriously sued in the mid-1990s for his fictionalisation of Stephen Spender’s life – has given us a subtle, deeply affecting update of Forster’s themes. In both books, the Indians at front and centre stage are not at the burning core of the novelist’s interest, which is in the English characters’ reactions to Indians and India. An American critic, Michael Gorda, has shrewdly observed that English identity was sharpened in encounters between colonisers and colonised in the days of the British Empire through opposition to some Other, an interplay from which Forster built Passage. Nothing like that lies behind The Indian Clerk. The undercurrents of unease about the ‘otherness’ of subcontinentals in the earlier novel are replaced, in Leavitt’s book, by an amused affection for Indian unknowability. Between the two novels, the West has of course lived through the 1960s, when striking elements of a so-called counterculture were imported Indian music, clothes, and superficially understood nuggets of Hindu philosophy and religion you could call om-ism. For the om-ists who overlapped with the turn-on-tune-in-drop-out crowd and their successors, the 2000s have brought improbable Indian software geeks and venture capitalists who seem far keener on making squillions than on spiritual enlightenment. The Western view of Indians has changed beyond imagining in Forster’s time. Belated recognition of the importance the subcontinent places on excellence in science and technology makes Leavitt’s focus on the mind of a singular Indian mathematician – one who did not fit the Western conception of a rational thinker – both apt and important. At the centre of Passage is a shadowy, disorienting cave in which there was or was not a sexual assault. In The Indian Clerk, that void, symbolising all that even admiring outsiders like Mr. Fielding and Mrs. Moore cannot fathom about India, is an equally elusive human being. Ramanujan, who would die at 32, a year after he left Cambridge, was born in 1887 in Madras (now Chennai) into a poor Brahmin family. He had a timid father, who worked as an accounts clerk, and a virago of a mother who unleashed her mathematical aptitude in her hobbies, which were astrology and numerology. The vastness of Ramanujan’s mathematical gift and its stunning originality were recognised early. Awarding him the top prize for maths in a school packed with exceptional students, the principal said that the highest possible score could not do him justice. He had mostly developed his aptitude on his own, using textbooks from England for a framework. But the rigidity of the Indian educational system led to his expulsion from both the colleges he attended. He could not make his mind pay attention to any subject but maths. Without a degree and after a protracted struggle, he found the help he needed to make a living for himself and the child bride Janakiammal he acquired when she was nine and he twenty-one. Patrons found him a day job as a lowly accounts clerk in the bureaucracy administering the port of Madras. For his real work, a special exception was made to the requirement of an MA for the position of independent research scholar at a renowned college. All this was done with the keen involvement of top administrators of the regional British Raj. Still, Ramanujan realised that to make his mark, he had to have the support of the empire’s leading mathematical scholars. Two of these men, fellows of the Royal Society, ignored his requests for help and the maths transcripts he enclosed with them. The third, G. H. Hardy — at 35, just ten years older than he was himself – not only replied but began a battle of many years to get him to come to Trinity College to work with him. It is mainly through Hardy’s eyes that Leavitt tells this story. As both the novel and Ramanujan’s exemplary biographer, Robert Kanigel, attest, each man’s place in the mathematical firmament is inseparable from the other’s – as firmly wedded as Francis Crick’s and James Watson’s are in the annals of DNA. Only someone who remembers rather more from higher maths classes than I do could fully appreciate Leavitt’s surpassingly smooth stitching-in of the work they do – for instance, a famous exchange in which Hardy fills an awkward silence by complaining that the taxi he has taken to Ramanujan’s bedside in hospital had a dull number, 1729. His friend immediately contradicts him. It is exceptionally interesting, he says, being ‘the smallest number expressible as the sum of two cubes in two different ways’ . (It is remarkable enough to have its own Wikipedia entry). All the general reader needs to know is that Hardy’s support for what he would later describe as Ramanujan’s ‘profound and invincible originality’ was critical. His particular gifts as a mathematician were both the perfect foil and tempering for his Indian collaborator’s. A consummate logician and fervent advocate of rigorous proof, Hardy had to overlook Ramanujan’s habit of stating only theorems or results without setting out their intermediate steps, which went with a wildly intuitive approach – and was partly a consequence of having been too poor to afford all the paper he needed for his non-stop scribbling, which in India he had mostly done on a slate. Most impressive about Leavitt’s novel is what it reveals about the chasm between the Indian and Western traditions of intellectual exploration. Western science had, in its beginnings, Euclid’s sublimely elegant and rigorous yet flexible geometric proofs. In India’s long, illustrious history of mathematical study, proofs were mostly treated as redundant. It was only the statement of results that mattered, not the precise steps by which they were reached. Yet formal proofs are so basic to Western maths that, as I was driving past a race track, thinking about this book, it occurred to me that in treating Ramanujan as a sort of honorary research scholar – even as he worked towards a BA – Trinity was doing more than ignoring his lack of formal qualifications. It was as intellectually generous as a Formula One sponsor backing a driver who does not share the same conception of what a car is or does. A serious challenge to Hardy’s hyper-rationality came from a report about the mission of a fellow don, Eric Neville, sent to South India to coax Ramanujan to come to Cambridge. Ramanujan’s vague excuse for repeatedly declining invitations had been ‘religious reasons.’ In Leavitt’s book, Neville’s wife, Alice, explains the true reason in a letter: the mathematician is afraid that in leaving India he risks being abandoned by the goddess Namagiri. His family relies on her for protection and she is, in his view, responsible for his discoveries in such realms as partition and continued fraction theory – because she ‘writes the numbers on his tongue’. This passage of the book made me wonder whether Leavitt’s imagination hadn’t taken a sensational leap too far for plausibility – until I checked the facts in Kanigel’s The Man Who Knew Infinity (1991). There, I discovered that Leavitt’s steady sprinkling of scraps of information about Ramanujan’s belief in supernatural forces understates the incommensurable truth. Kanigel’s documentation of this faith is lavish. He quotes, for instance, a former accountant-general of Madras who remembered Ramanujan telling him that in dreams in which he saw the male consort of Namagiri, ‘scrolls containing the most complicated mathematics used to unfold before his eyes.’ He shows how dream interpretation, palmistry and astrology influenced crucial decisions with which Ramanujan wrestled. All that makes it specially wonderful that the mathematical discoveries of the mystical auto-didact have been used in polymer chemistry, crystallography, string theory, computer science and cancer research. Hardy batted away all suggestions that Ramanujan was not every inch the rationalist he was himself, or that his friend’s religion and dabbling in the occult were more than a façade of Hinduism kept up for social reasons. Leavitt’s Hardy refers to Namagiri as ‘Namby-Pamby’. He stands in for all of us, conditioned by Western rationalism and science to dismiss reflexively any imaginable benefits of archaic and non-linear ways of thinking. Each act of creation is a particular product of 0 and ∞, from which a particular individual emerges. The things we can never know because they are unknowable and the things we can never know because there . . . [is] . . .[a]n infinitude of them. From this coupling a life is born. Kanigel suggests that at some level, Hardy grasped that it was not necessary to share Ramanujan’s mystical beliefs to appreciate what they demonstrated – ‘a peculiar flexibility of mind, a special receptivity to loose conceptual linkages and tenuous associations.’ As proof of this understanding, the biographer points to Hardy’s assessment of another mathematician who, he said, would have been ‘greater [. . .] if his mind had worked with less precision; that ‘the best of his work is a little wanting of imagination,’ and that he ‘lacked the power of “thinking vaguely.” ’ Hardy, Kanigel believes, knew very well that the unruliness of Ramanujan’s genius was responsible for mathematical insights described as ‘transcendental’ by one of his loftiest British champions in the Madras Raj after consultation with ‘very high mathematical authorities’. Mostly, Hardy shut the door on any discussion of Ramanujan’s personal beliefs and business. That was not least because he himself remained a deeply reserved and eccentric bachelor all his life, afflicted with more than the archetypal Englishman’s terror of intimacy. A novelist is free to choose any vantage point for a story. Leavitt’s settling on Hardy for that purpose is inspired, since it takes readers into secret gay Cambridge society around World War I and, with signal charm, into the everyday thoughts and feelings of pure mathematicians. Ramanujan came to Cambridge alone in badly fitting clothes and shoes he was not used to wearing. Wartime travel restrictions cut him off from all contact with his family and Madras. A strict vegetarian, he could only rarely get hold of the ingredients for meals he had taught himself to cook. He was chronically cold and did not, for most of his English sojourn, understand how to sleep in an English bed. When he fell gravely ill, he was sent from one eminent specialist to another, but the disease that killed him a year after his return to India was never diagnosed. In this phase, when he became one of the youngest-ever fellows of the Royal Society, at twenty-nine, he was placed in a TB sanatorium – for want of an alternative institution – so underheated that he had to work in its bathrooms, the only warm spots. Above all, he needed mothering. Leavitt shows us Alice Neville, the wife of the don who lured him from Madras, unsuccessfully attempting this role and, as he imagines, falling in love with him. But Hardy was his official caretaker, and Leavitt writes affectingly of his lack of any of the right instincts and skills, having been poorly mothered himself. This relationship makes the terrible facts of Ramanujan’s decline unbearably poignant. The intense sympathy of Leavitt, who is gay, writing about Hardy – presumed by experts on his life to have been of the same persuasion – makes the novel more emotionally compelling than any scene in Passage. I found it fascinating to feel, as a heterosexual reader, a greater empathy with Hardy than with Fielding, his technical equivalent in Forster’s story. It was odd but amusing to enter Ramanujan’s story through relationships between – and the wacky rituals of – the Apostles, the clandestine Cambridge club whose famous members of the day included Bertrand Russell, John Maynard Keynes and Lytton Strachey. Equally captivating is Leavitt’s evocation of a Cambridge whose general population was as keenly interested in a famous competitive examination of the era, the mathematical tripos, as in cricket. Portraits of the highest scorer, known as the Senior Wrangler, were snapped up at newsagents’, and their looks minutely dissected by lecherous and feline dons.